If you’ve read any of my reviews before then you’ll know I’m a big fan of both music and animation studio A-1 Pictures. Combine the two for a heartfelt coming-of-age story like Anthem of the Heart and we’re left with something quite fascinating. For a girl unable to speak her heart, is the power of song a way for her to share her unspoken feelings? 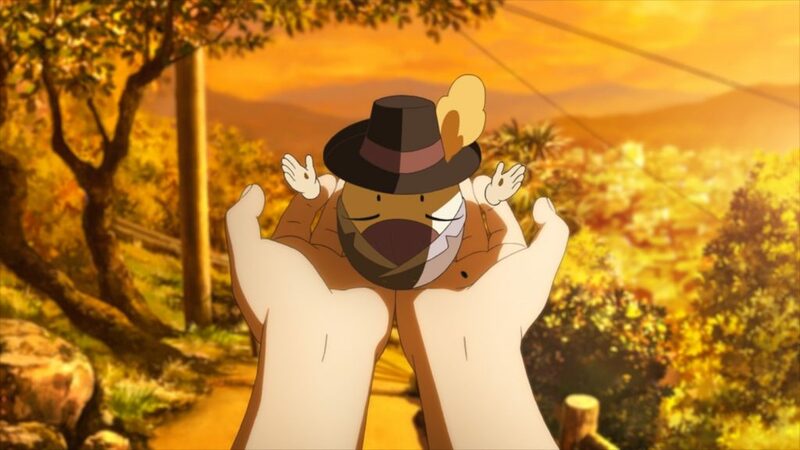 The story revolves around Jun Naruse who, as a child, was known for being a chatterbox and always saying whatever came to mind. However one day she sees her father leaving a love hotel with another woman and runs home to tell her mother about it – which ends in her parents divorcing. After being blamed by her father for causing the separation, Jun runs away upset and encounters an egg-shaped fairy who steals her words. This means Jun can no longer speak without causing a severe stomach ache (which means she can only speak a word or two overall), but she believes it’s for the best, given that words can hurt people and she never wants to harm anyone again. While in high school, Jun and three of her classmates, Takumi Sakagami, Natsuki Nito, and Daiki Tasaki are chosen by their homeroom teacher to be on the Charity Committee and together they must decide on a project for the class to perform for a community event. At first everyone adamantly refuses to being on the committee, but after the class are taught about the power of musicals and how if you can’t say something then singing it can help – Jun decides that the class should perform a musical. It just so happens that Takumi has a talent for music, can play piano and is in the perfect position to help Jun achieve her goal. 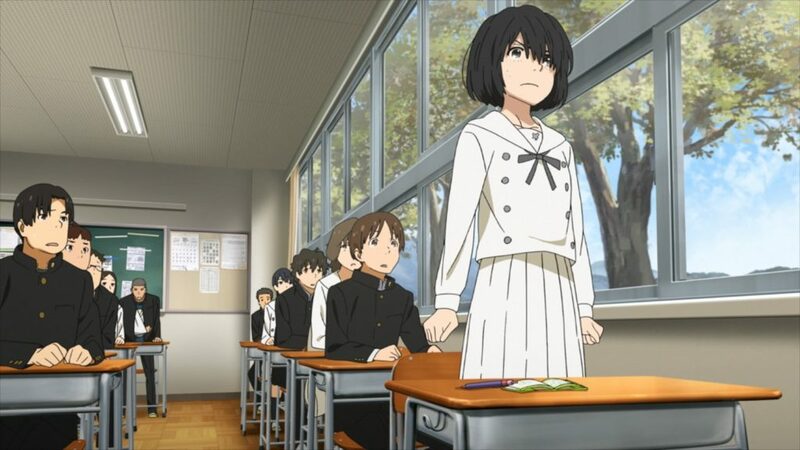 Can Jun convince the class to work on the musical and finally sing out her feelings or will she be silent for the rest of her life? Anthem of the Heart is an emotional story – but I do wonder if some of the emotion is a little lost on a viewer who might not be as aware of Japanese culture as I am. For example, Jun’s mother sees her daughter as a disgrace to the family after she refuses to talk. Now the movie deals with this fairly well for a Western viewer, and it’s obvious to see why Jun’s mother is so upset (because they put in a mention that the neighbours are gossiping), but I think it’s definitely something that could throw you off if you’re not familiar with why it is happening. I also question the fantastical fairy element. It’s not something that really takes away from the story all that much, but I question if it really needs to be there at all. The fairy only pops up for the beginning of the story and near the end and while there is a point to it, I think the same idea could have been done without it. Regardless, it’s not a huge issue, just something I found myself mulling over. What I really like about Anthem of the Heart is how it deals with music. Takumi talks about how music is meant for something, to convey emotions, thoughts and feelings that perhaps can’t be said normally. This concept is something I’m very fond of and it’s nice to see a series that makes such good use of it to solve real problems, like those that Jun faces. Even away from the musical side of things Anthem of the Heart truly excels in telling its story with a wonderful cast. The four committee members all have problems of their own and after they’re brought to together, we’re shown how they deal with them over the course of the story. 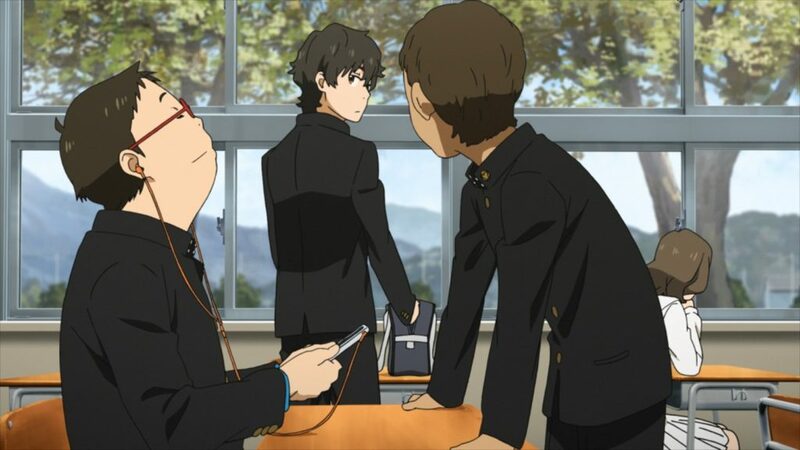 Daiki, for example, is on the school baseball team but after getting injured, he’s been unable to play. Sitting on the sidelines coaching the team has earned him some dislike from fellow players and it seems that no one really wants him around. Daiki must overcome this and win back the respect of his teammates, which is interesting and different to what Jun is facing. 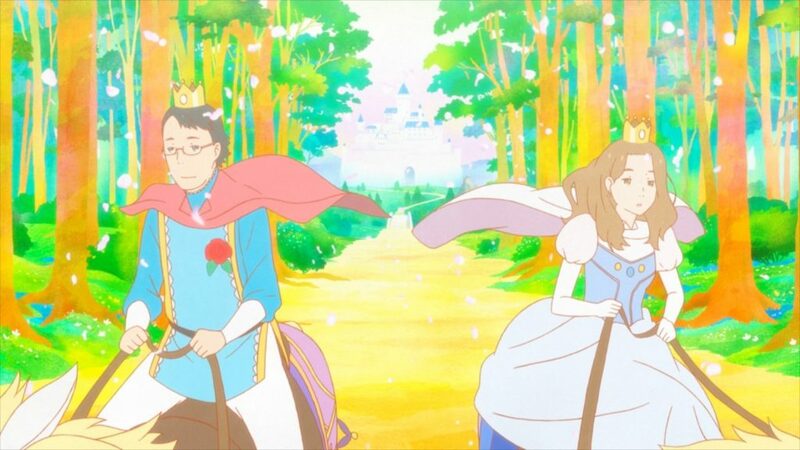 The movie has been put together by A-1 Pictures and, notably, the staff behind Anohana: The Flower We Saw That Day. The animation overall is crisp and colourful, while character designs are smooth and well animated. This is especially true for Jun who, for lack of talking, conveys all her emotion through facial expressions and it looks as though a lot of care and attention has gone into these. Musically the movie has been handled by Masaru Yokoyama (Yamada-kun and the Seven Witches, Your Lie in April) and Mito (She and Her Cat: Everything Flows). Together the two have put together a wonderful soundtrack full of sweet piano pieces for everyday life, as well as adapting some classic musical scores for the show – such as Over the Rainbow. Voice actors are yet another plus in the show’s favour. Jun is voiced by Inori Minase (Rem in Re:Zero, Hestia in Is It Wrong to Try to pick Up Girls in a Dungeon?) and Minase plays the role very well. Jun is no doubt fairly difficult to play, with her lack of voice, but Minase adds a lot of character to her with the slightest vocalisation when Jun does try to talk. Koki Uchiyama (Tomura Shigaraki in My Hero Academia, Momo Sakaki in Anonymous Noise, Yuri Plisetsky in Yuri!!! on Ice) who plays Takumi also provides a strong performance in his role. Takumi is a fairly quiet character overall, but he’s brought to life through Koki’s emotional acting. I will say that it was mildly distracting that Koki voices both Takumi and the fairy. There is no connection between the two and yet I was left wondering if there was for a while. Thanks to Anime Limited, this release comes to the UK as a Collector’s Edition that includes the movie on both Blu-ray and DVD, as well as a standard DVD release. The Collector’s Edition includes a booklet of artwork, and both sets include trailers and a title-free version of the ending theme as on-disc extras. The release is Japanese-only as there is no English dub for the movie. It’s also worth noting that at the time of writing the release date of the standard DVD is now due out on the 7th of August, rather than on the same day as the Collector’s Edition. 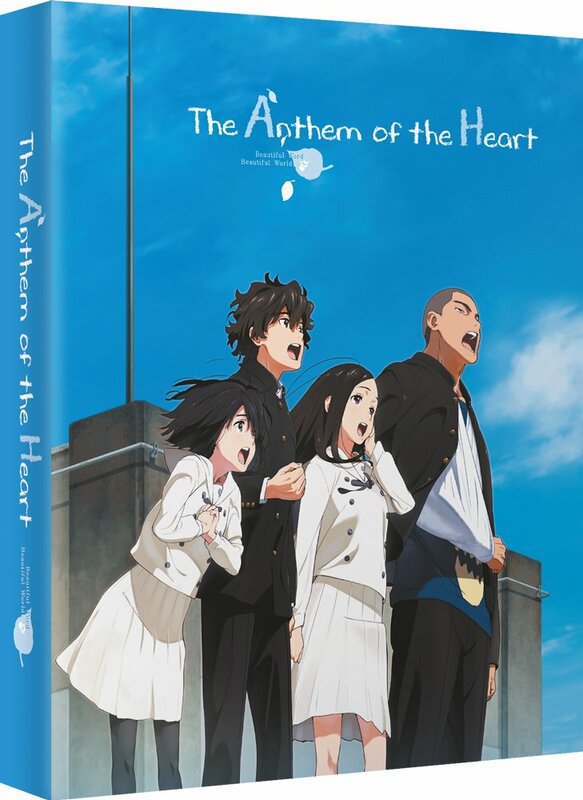 Overall, Anthem of the Heart is a fantastic coming of age story with relatable characters and a clear idea of what it wants to achieve. It’s something I can recommend to everyone and even if I question a couple of its choices, I think the film is near flawless. Anthem of the Heart is truly heartfelt and is a must-see work.